In some parts of this country Talking Therapy can take up to a year's wait. And if only you knew the hoops that a friend of mine has to jump through - hours and hours of phone calls being tossed from one department to another and then weeks of waiting for an appointment - when she is suicidal! Aaargh! It's by no means a common experience, but there are some books one starts bursting to write about a mere twenty pages in. 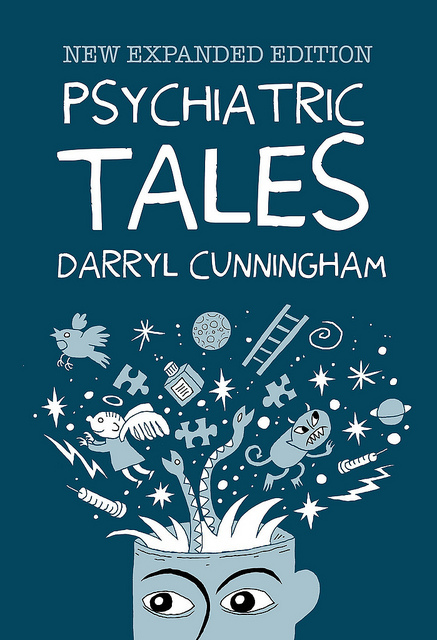 PSYCHIATRIC TALES is one of those: a book of such instinctive, level-headed compassion, communication and education which nearly never saw completion on account of the creator's own deteriorating mental health. A childhood riddled with self-loathing only grew worse in adulthood as Cunningham withdrew at the very time he most craved connection. It was his artistic talent that finally gave him a sense of belonging, whilst his desire to understand his own condition and his natural empathy for others, so clearly evidenced here, led him into work as a health care assistant before training as a student to qualify as a mental health nurse. "And this is when I overreached myself. This is when I broke." After reading the book you will easily comprehend why. It's no easy job for the sturdiest of individuals but for someone as vulnerable and sympathetic as Darryl, well, it was going to get to him eventually. The book isn't about Darryl, though: the preceding pages detail his experiences on the ward and what he learned about various debilitating mental conditions as a result. The very opposite of sensationalist, its measured contents will undoubtedly still prove affecting for there can be few of us who haven't come into contact with mental illness: schizophrenia with its attendant paranoia and hallucinations; bipolar disorder with its peaks and troughs and compulsion to communicate everything at once; violent anti-social personality disorders; the dementia of Alzheimer's - the disorientation and delusion and reversion to an earlier period in life; self-harming from anger, self-loathing and a desperation to assert any sort of control even if it involves physical pain as a distraction from the mental anguish; suicide. Each condition is explained through personal observation and with an education that enables Cunningham to detail current treatments, rebalancing the brain's chemicals whilst providing the most efficacious environment wherever possible. And without meaning to alarm you, Darryl correctly places an emphasis on one particular truth: it can happen to anyone at any time. At school the brother of my best friend suddenly started pronouncing himself to be the Second Coming and appointed disciples. 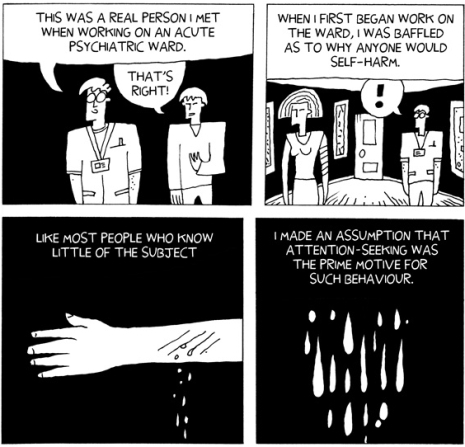 I've met several self-harmers and known them for years. I know at least one bi-polar, my grandmother slid away from us under Alzheimer's, someone very close to me is suffering with acute depression and, I guess, most disturbingly of all, a young man I thought brilliant and charming abruptly became barely coherent, violent (he tried to kill his mother and girlfriend) and - because he'd already been misdiagnosed as having a mere behavioural disorder - it took his parents a whole year of research and fighting to get the man properly diagnosed with Cannabis Psychosis and therefore properly treated. I recognise everything I read here. It's spot-on, including the patient's delusion, post-recovery, that sustained medication is no longer necessary. 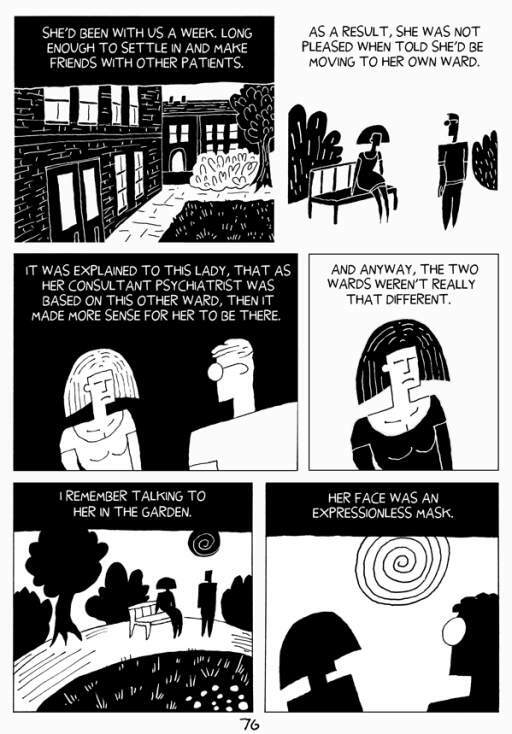 As to the artwork, it's deceptively simple just like Satrapi's in PERSEPOLIS for maximum empathy, black shadows casting faces into silhouette, a warning of potential bleak, black moods. 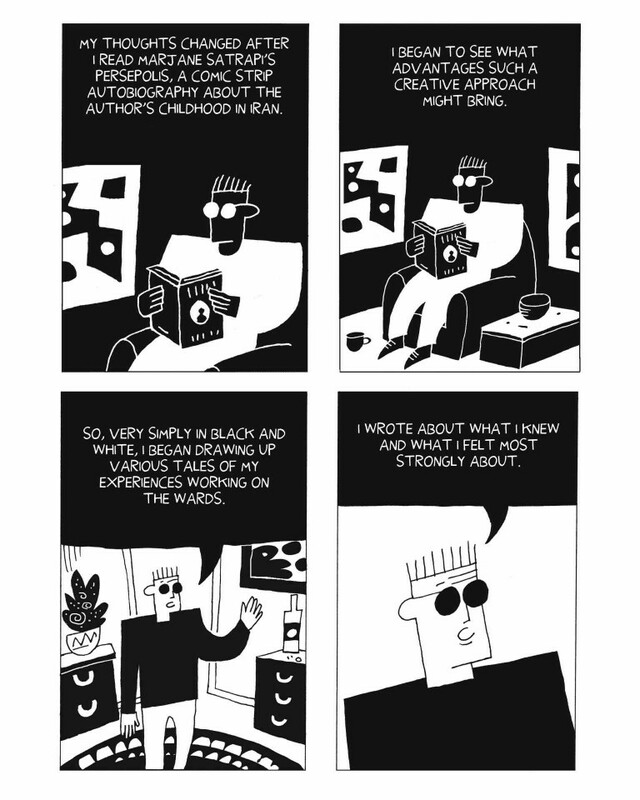 It's the perfect balance between word and picture, so as sequential art it reads like a dream. Or a nightmare. 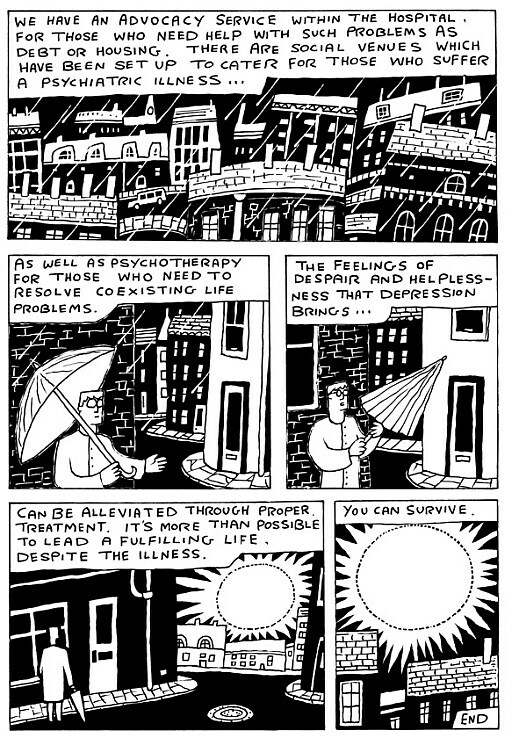 "The effects of suicide ripple outward. Damaging family, friends and strangers alike. A suicide will leave an average of six people immediately affected by the death. A parent, a significant other, a sibling, or a child of the deceased person. The people are referred to as the survivors. These are the ones left to suffer. Never knowing why, always wondering if he could have done more."